Summer is soon approaching and the topic of mosquito control is on the rise. Beginning this summer Nebraskaland Aviation will be offering a mosquito fogging service for farmsteads, golf courses, and any other residential areas to help prevent mosquito complications for you and your families. Not only are mosquitoes a general nuisance but also current and new mosquito viruses are becoming a major issue in the United States. We would like to provide you with information to help guide you on what you can do for your farmstead or residential area to prevent mosquitoes from becoming not only a bothersome issue but also a health risk. According to the Centers for Disease Control and Prevention, “Chemical control measures are one part of a comprehensive and integrated mosquito management program.” The CDC also states that “An integrated program is the most effective way to prevent and control mosquito-borne disease.” Not only does an effective program include the application of bug sprays to repel mosquitoes, it includes the use of pesticides and biological methods to control both mosquito larvae and adult mosquitoes which in turn will help to prevent not only the West Nile Virus but also the emerging Zika Virus. Q: How do you get infected? A: Infected by the bite of an infected mosquito. Q: Who is at risk for infection with WNV? A: Anyone living in an area where the virus is present in mosquitoes, highest risk for those who work outdoors or participate in outdoor activities. Q: How can people reduce the chance of getting infected? A: Prevention is key; with the help of mosquito fogging, we can reduce the number of mosquitoes around your home to decrease the number of mosquitoes that may carry a mosquito-borne disease. A: Infected by the bite of an infected Aedes species mosquito. No local mosquito-borne Zika virus cases have been reported in the US, but with the recent outbreak, the number of cases will likely increase with those returning to the US from Zika positive countries. Who is at risk for infected with Zika? A: Anyone who lives in or travels to an area with the virus and has not already been infected with the virus; pregnant women need to be especially cautious because it has been linked to serious birth defects. A: You must prevent the problem; with the use of mosquito repelling services, we can provide you with the most efficient way of preventing mosquito outbreaks. With our certified applicators and equipment, we are able to provide this form of pest control. This application of “mosquito fog” can be applied around your yards a number of times throughout the summer months to secure a safe outdoor area for you and your family to enjoy. The aerosol ULV generator we use fogs a pesticide into the surrounding area to control mosquitoes that carry mosquito-borne diseases that may infest your area. Mosquitoes are active just around dusk and dawn, therefore we would provide this service at these times to target active mosquitoes for the best results in decreasing the adult mosquito population. With the topic of family safety in mind, the product we will be using is safe and approved for use in outdoor residential areas with little to no harm to you, your family, pets or livestock. Don’t let your summer of outdoor activities and entertainment with friends and family be spoiled by mosquitoes. We can perform this service around your home to provide you with quick, effective results. Our program will begin with an on-site inspection of potential breeding sites. Following this inspection, larvicides may be used in standing water, such as ponds or other water features in the landscape to stunt the growth of mosquitoes’ offspring before they become biting adults. Following the initial inspection, our mosquito fogging service will begin the week of May 23rd and end the last week of September with 1 treatment every 8-12 days for a total of 13 treatments (weather permitting). The price for this program is $1950 per year based on a standardly sized farmstead consisting of 1.5 acres or less. We can give a custom quote for larger areas, different treatment frequencies or one-time events such as weddings, family celebrations or any other special occasions upon request. We are currently developing routes for summer treatments. If you are interested, please sign up early so we can get you on our scheduled application route! 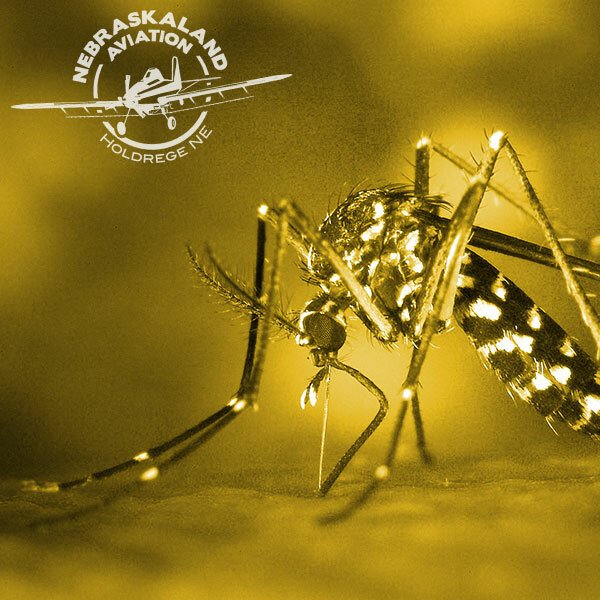 If you have any questions or concerns, please call Nebraskaland Aviation or visit this website at www.NebraskalandAviation.com under the “Services tab | Mosquito Treatment” today for more information about our mosquito fogging services. We greatly appreciate your business and wish you a successful year!